Nominated as one of America's best-loved novels by PBS's The Great American Read The #1 New York Times Bestseller On a warm summer morning in North Carthage, Missouri, it is Nick and Amy Dunne's fifth wedding anniversary. Presents are being wrapped and reservations are being made when Nick's clever and beautiful wife disappears. Husband-of-the-Year Nick isn't doing himself any favors with cringe-worthy daydreams about the slope and shape of his wife's head, but passages from Amy's diary reveal the alpha-girl perfectionist could have put anyone dangerously on edge. Under mounting pressure from the police and the media--as well as Amy's fiercely doting parents--the town golden boy parades an endless series of lies, deceits, and inappropriate behavior. Nick is oddly evasive, and he's definitely bitter--but is he really a killer? "Ice-pick-sharp... Spectacularly sneaky... Impressively cagey... Gone Girl is Ms. Flynn's dazzling breakthrough. It is wily, mercurial, subtly layered and populated by characters so well imagined that they're hard to part with -- even if, as in Amy's case, they are already departed. And if you have any doubts about whether Ms. Flynn measures up to Patricia Highsmith's level of discreet malice, go back and look at the small details. Whatever you raced past on a first reading will look completely different the second time around." "An ingenious and viperish thriller... It's going to make Gillian Flynn a star... The first half of Gone Girl is a nimble, caustic riff on our Nancy Grace culture and the way in which ''The butler did it'' has morphed into ''The husband did it.'' The second half is the real stunner, though. Now I really am going to shut up before I spoil what instantly shifts into a great, breathless read. Even as Gone Girl grows truly twisted and wild, it says smart things about how tenuous power relations are between men and women, and how often couples are at the mercy of forces beyond their control. As if that weren't enough, Flynn has created a genuinely creepy villain you don't see coming. People love to talk about the banality of evil. You're about to meet a maniac you could fall in love with." "How did things get so bad? That's the reason to read this book. Gillian Flynn -- whose award-winning Dark Places and Sharp Objects also shone a dark light on weird and creepy, not to mention uber dysfunctional characters -- delves this time into what happens when two people marry and one spouse has no idea who their beloved really is." "It's simply fantastic: terrifying, darkly funny and at times moving. The minute I finished it I wanted to start it all over again. Admirers of Gillian Flynn's previous books, Sharp Objects and Dark Places, will be ecstatic over Gone Girl, her most intricately twisted and deliciously sinister story, dangerous for any reader who prefers to savor a novel as opposed to consuming it whole in one sitting...."
"Gillian Flynn's third novel is both breakneck-paced thriller and masterful dissection of marital breakdown... Wickedly plotted and surprisingly thoughtful, this is a terrifically good read." "That adage of no one knows what goes on behind closed doors moves the plot of Gone Girl, Gillian Flynn's suspenseful psychological thriller... Flynn's unpredictable plot of Gone Girl careens down an emotional highway where this couple dissects their marriage with sharp acumen... Flynn has shown her skills at gripping tales and enhanced character studies since her debut Sharp Objects, which garnered an Edgar nod, among other nominations. Her second novel Dark Places made numerous best of lists. Gone Girl reaffirms her talent." --South Florida Sun-Sentinel, Oline Cogdill "A great crime novel, however, is an unstable thing, entertainment and literature suspended in some undetermined solution. Take Gillian Flynn's Gone Girl, the third novel by one of a trio of contemporary women writers (the others are Kate Atkinson and Tana French) who are kicking the genre into a higher gear... You couldn't say that this is a crime novel that's ultimately about a marriage, which would make it a literary novel in disguise. The crime and the marriage are inseparable. As Gone Girl works itself up into an aria of ingenious, pitch-black comedy (or comedic horror -- it's a bit of both), its very outlandishness teases out a truth about all magnificent partnerships: Sometimes it's your enemy who brings out the best in you, and in such cases, you want to keep him close." "Ms. Flynn writes dark suspense novels that anatomize violence without splashing barrels of blood around the pages... But as in her other books, Ms. Flynn has much more up her sleeve than a simple missing-person case. As Nick and Amy's alternately tell their stories, marriage has never looked so menacing, narrators so unreliable." --Time "Readers who prefer more virulent strains of unreality will appreciate the sneaky mind games of Gillian Flynn's Gone Girl, a thriller rooted in the portrait of a tricky and troubled marriage." "[Flynn has] quite outdone herself with a tale of marital strife so deliciously devious that it moves the finish line on The War of the Roses... A novel studded with disclosures and guided by purposeful misdirection... Flynn delivers a wickedly clever cultural commentary as well as a complex and driven mystery... What fun this novel is." "Flynn's brilliantly constructed and consistently absorbing third novel begins on the Dunnes' fifth wedding anniversary... The novel, which twists itself into new shapes, works as a page-turning thriller, but it's also a study of marriage at its most destructive." "Gillian Flynn's new novel, Gone Girl, is that rare thing: a book that thrills and delights while holding up a mirror to how we live... Through her two ultimately unreliable narrators, Flynn masterfully weaves the slow trickle of critical details with 90-degree plot turns... Timely, poignant and emotionally rich, Gone Girl will peel away your comfort levels even as you root for its protagonists--despite your best intuition." "I picked up Gone Girl because the novel is set along the Mississippi River in Missouri and the plot sounded intriguing. I put it down two days later, bleary-eyed and oh-so-satisfied after reading a story that left me surprised, disgusted, and riveted by its twists and turns... A good story presents a reader with a problem that has to be resolved and a few surprises along the way. A great story gives a reader a problem and leads you along a path, then dumps you off a cliff and into a jungle of plot twists, character revelations and back stories that you could not have imagined. Gone Girl does just that." "To call Gillian Flynn's new novel almost review-proof isn't a put-down, it's a fact. That's because to give away the turn-of-the-screw in this chilling portrait of a marriage gone wrong would be a crime. I can say that Gone Girl is an ingenious whodunit for both the Facebook generation and old-school mystery buffs. Whoever you are, it will linger, like fingerprints on a gun... Flynn's characters bloom and grow, like beautiful, poisonous plants. She is a Gothic storyteller for the Internet age." 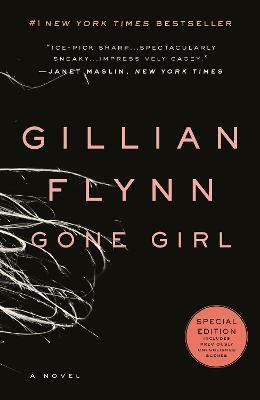 "The setup of Gone Girl lulls readers with what appears to be a done-too-often plot, but, oh, how misleading that is. This thriller is told in alternating voices, a risky form of narrative that works masterfully here because the characters are so distinct and convincing.... The first half of the story leads readers on a merry chase and gives the term "red herring" new meaning. The second half takes readers on a calculated descent into madness. The ending...is one of the most chilling we've seen in recent years." "Gillian Flynn's terrific psychological thriller, Gone Girl, wanders into an alternate criminality, to the darkest corners of mind and matrimony, using Occam's razor to slit its own throat... Aside from the plot's high entertainment value, Flynn has buttressed her book with humor and great writing." "Gone Girl is a dark, satisfying, psychological thriller... Gone Girl is at times brilliant, compelling, surprising, diabolical, and it's definitely dark and twisted... It ranks as one of the best books I've read in the past year...I'd highly recommend it if you're a fan of psychological thrillers or just plain great fiction." "An unnerving, gorgeously written marital thriller that features one of the most compelling narrators in recent memory... Anyway, go read Gone Girl. It's quite good." Flynn's ability to reach further and further into the deep, dark recesses of the human psyche brings a much greater edge and feeling of suspense to this novel. Gone Girl is a fast-paced, always surprising page-turner of a book...Gone Girl is a superbly crafted novel by a talented and daring young writer and it will keep you guessing until the very last sentence." "Dark yet funny with a devious twist, this is everything that made Flynn's Sharp Objects a bestseller--but better." "The story unfolds in precise and riveting prose...even while you know you're being manipulated, searching for the missing pieces is half the thrill of this wickedly absorbing tale." "Full of midnight-black wit and gorgeous writing...About halfway through the book, something happens...That's the moment you should check the clock and firmly put the book down if you have to rise early the next day. Because trust me, if you keep reading, you won't stop till you finish it." "Gillian Flynn's third mystery is burned-coffee black and flavored with cyanide. (As far as I'm concerned, those are compliments of the highest order. )...Flynn is a master manipulator, deftly fielding multiple unreliable narrators, sardonic humor, and social satire in a story of a marriage gone wrong that makes black comedies like "The War of the Roses" and "Who's Afraid of Virginia Woolf" look like scenes from a honeymoon. Veteran mystery readers may see as far as the opening of the second act, but Flynn has more surprises in store on her way to the sucker-punch of an ending. It is, in a word, amazing." "A perfect wife's disappearance plunges her husband into a nightmare as it rips open ugly secrets about his marriage and, just maybe, his culpability in her death... One of those rare thrillers whose revelations actually intensify its suspense instead of dissipating it. The final pages are chilling." --Kirkus (starred review) "[W]hat looks like a straightforward case of a husband killing his wife to free himself from a bad marriage morphs into something entirely different in Flynn's hands. As evidenced by her previous work (Sharp Objects, 2006, and Dark Places, 2009), she possesses a disturbing worldview, one considerably amped up by her twisted sense of humor. Both a compelling thriller and a searing portrait of marriage, this could well be Flynn's breakout novel. It contains so many twists and turns that the outcome is impossible to predict." --Booklist (starred review) "Flynn cements her place among that elite group of mystery/thriller writers who unfailingly deliver the goods...Once again Flynn has written an intelligent, gripping tour de force, mixing a riveting plot and psychological intrigue with a compelling prose style that unobtrusively yet forcefully carries the reader from page to page." --Library Journal (starred review) "Flynn masterfully lets this tale of a marriage gone toxically wrong gradually emerge through alternating accounts by Nick and Amy, both unreliable narrators in their own ways. The reader comes to discover their layers of deceit through a process similar to that at work in the imploding relationship. Compulsively readable, creepily unforgettable, this is a must read for any fan of bad girls and good writing." "Gone Girl is one of the best -and most frightening -portraits of psychopathy I've ever read. Nick and Amy manipulate each other -with savage, merciless and often darkly witty dexterity. This is a wonderful and terrifying book about how the happy surface normality and the underlying darkness can become too closely interwoven to separate." "I cannot say this urgently enough: you have to read Gone Girl. It's as if Gillian Flynn has mixed us a martini using battery acid instead of vermouth and somehow managed to make it taste really, really good. Gone Girl is delicious and intoxicating and delightfully poisonous. It's smart (brilliant, actually). It's funny (in the darkest possible way). The writing is jarringly good, and the story is, well...amazing. Read the book and you'll discover--among many other treasures--just how much freight (and fright) that last adjective can bear." "Gone Girl manages to be so many stellar things all at once--suspenseful, inventive, chilling, funny, unsettling--as well as beautifully plotted and fiercely well-written. Gillian Flynn is a thrilling writer." --Kate Christensen, author of The Great Man "Reminds suspense readers of the old Alfred Hitchcock stories...This is one puzzle you do not want to miss." "Absorbing thriller...In masterly fashion, Flynn depicts the unraveling of a marriage - and of a recession-hit Midwest - by interweaving the wife's diary entries with the husband's first person account."